This FREE little pdf clocks in at 6 pages, 1 page editorial, leaving 5 pages of content, so let’s take a look! We begin with a nice introduction to the matter at hand and then are introduced to the Templar Knight. These guys must be lawful and may deflect an amount of damage equal to his level plus the sword’s enhancement, but the decision to deflect the attack must be made before the results of the damage-roll are made known. If the fighter also reconsecrates and reforges his sword in a ceremony, the character may also add his Strength-modifier to the amount of damage deflected. 1/day, he may also sway the undecided, up to character level of NPCs, to his side of the argument. At 3rd level, he may 1/day attack twice in a round, +1/day every 3 levels thereafter and at 12th level, he may always make 2 attacks per round. The second swordsman-kit herein is the Slayer, who needs to be neutral. 1/day, when wielding an iconic blade (e.g. tempered by dragon fire), he may declare a hit a critical. When a slayer kills a foe, he may 1/day attack an additional opponent, +1/day at 5th level and every 5 levels thereafter, up until 15th level, hen he may always do that. He gets the same two-attacks-per round progression as the templar. The third kit, the Reaver, needs to be chaotic. For each foe killed or mortally wounded, the reaver penalizes her foes’ attacks by the number of felled foes, up to the max bonus of the reaver’s blade. Per se nice idea, but when does the counter reset? A precise duration would have been nice, otherwise you can just kill a bunch of kittens… Attacking dazed, stunned blinded, prone, fallen, subdued, unconscious or unaware are particularly endangered by the reaver: Reavers get + atk and damage against such foes. The reaver gets the same additional attack progression as the previous two kits. Finally, the book ends with a cool table that represents blades of fallen heroes awakening with special powers – this table is fun and awesome. Editing and formatting are very good, I noticed no glaring glitches. 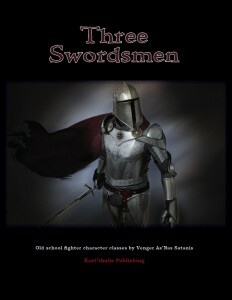 Layout adheres to a printer-friendly two-column b/w-standard and the pdf sports one great b/w-artwork per swordsman. The pdf comes sans bookmarks, but needs none at this length. The kits provided herein can be considered well-crafted, if not particularly unique: The templar is certainly the most captivating of the kits in this pdf. The other two basically sport mechanics from more current editions of the system, translated to OSR, but done so in a pretty precise way, considering the need to provide support for different variants of OSR-rules. The reaver has slight flaws in its details and feels a bit weaker than the other two, but overall, this pdf is well-crafted. And it’s FREE. Free pdfs are hard to beat, particularly when the “fallen PC’s blade”-table alone is an awesome reason to download this free book, even when playing in other systems and requiring some inspiration. As such, I feel justified in awarding this 5 stars + seal of approval – this is well worth the download. You can get this neat little pdf for FREE here on OBS! Wasn’t aware you reviewed this one. Thanks, hoss!